The "Polyplanter" can precision sow most uncoated seeds with precision accuracy. This can be done because the 'Polyplanter" uses one of the most accurate seed units ever designed. This being the vacuum seed unit. Its precision includes the singulation of seeds from the size of pepper seeds on up to large seeds such as lima beans. For example, this unit does an excellent job of singulating the supersweet sweet corn seeds, a seed that does not have a standard shape. The simplicity of the circle is used for the planting head. Thus, giving good accuracy and long life to the system. The circumference is app. 80" , the following spacings can be made using a different number of points. A six point wheel can easily be converted to a three point, simply by removing some points and changing the seed plate. Seeds such as cucumbers can can also be precision dropped 1, 2, or 3 seeds at a time per point if desired. Also in about fifteen minutes, a complete planting head can be changed thus changing the spacing! The hole is cut into the plastic instead of being torn, thus leaving a lot less flap. Also the seeds are planted in the middle of the hole for excellent seed placement. Depth adjustment is simply regulated by adjusting the packing wheel and the down pressure on the packing wheel is regulated by a tension spring, providing uniform depth and cover for the seed. The "Polyplanter" can be built to seed through 3 rows of plastic at the same time and on raised beds as high as 12". Also it can be made to lay the plastic and plant at the same time. 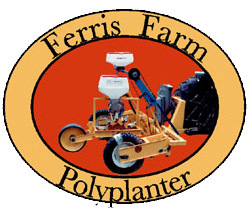 Polyplanter............................Making plastic work for you !!!!!!!!!!!!!!! Polyplanter............................Putting seeds where they grow best!!!!! Polyplanter............................Planting seeds for earlier maturity!!!!!!!! Polyplanter............................Planting seeds for higher yields!!!!!!!!!!! Polyplanter............................Maximizing your return per $ invested! !